Iraq’s streets are unsafe, its people tormented, and its identity as a state challenged from within and without. For some, Iraq is synonymous with internal hatred, bloodshed, and sectarianism. The contributors to this book, however, know another Iraq: a country that was once full of hope and achievement and that boasted one of the most educated workforces in its region—a cosmopolitan secular society with a great tradition of artisans, poets, and intellectuals. The memory of that Iraq inspired the editors of this volume to explore Iraq’s current struggle. The contributors delve into the issues and concerns of building a viable Iraqi state and recognize the challenges in bringing domestic reconciliation and normalcy to Iraqis. 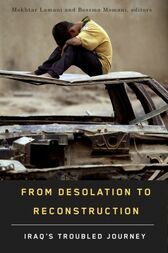 From Desolation to Reconstruction: Iraq’s Troubled Journey examines Iraq’s reality after the 2003 US-led invasion. It begins by relating Iraq’s modern social and political history prior to the invasion and then outlines the significant challenges of democratization and the creation of an Iraqi constitution, which will be necessary for Iraq to become a strong and effective state. Co-published with the Centre for International Governance Innovation (CIGI).